This was fantastic. Tender, juicy, chicken that fell right off the bone. Nutty, brown rice with just the right touch of seasonings. This is definitely one I’ll come back to again and again. As I mentioned in the comments, I used a brown rice blend, but I think it would be equally good with any kind of rice. Heat olive oil in a large saute pan. Add onion and cook on medium until soft. Add garlic and rice, stir to coat, and cook, stirring, about a minute. Add seasonings, tomatoes, and chicken broth. Place the chicken pieces on top. Bring to a boil, then cover and reduce heat. Simmer until the rice is tender, about 45-60 minutes. This looks fantastic and simple to prepare. 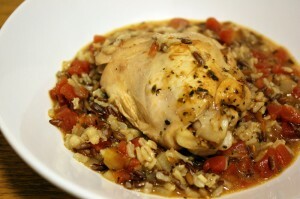 Did you use a brown and wild rice mixture? It’s a blend of brown and red rice with pearled barley and rye berries, made by texmati. It’s just what I had on hand. I think any kind of rice would work, but cooking times might vary depending on which variety you use, just make sure the chicken is cooked through.